(Nanowerk News) Researchers have demonstrated that single gold nanowires can be trapped in three dimensions by single-beam optical traps ("Why Single-Beam Optical Tweezers Trap Gold Nanowires in Three Dimensions"). The experimental findings are corroborated by electrodynamics simulations. These results extend the list of plasmonic nanostructures that can be trapped in three dimensions by single-beam optical tweezers from nanoparticles and nanorods to much longer nanowires, which were formerly considered impossible to trap. 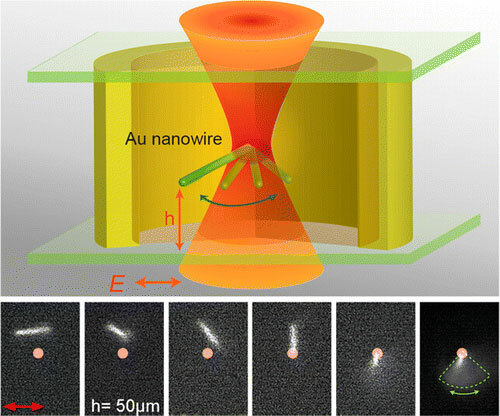 Researchers demonstrate that a single, tightly focused laser beam with a wavelength of 800 nm can achieve three-dimensional optical trapping of individual gold (Au) nanowires with lengths over 2 µm. Nanowires can be trapped by the beam at one of their ends, in which case they undergo significant angular fluctuations due to Brownian motion of the untrapped end. They can also be trapped close to their midpoints, in which case they are oriented approximately perpendicular to the light polarization direction. The behavior is markedly different from that of Ag nanowires with similar length and diameter, which cannot be trapped in three dimensions by a single focused Gaussian beam. The results indicate that the previous concern – that absorption and scattering in large metal particles are too strong to allow single-beam optical trapping – is overly simplified. Other issues, such as colloidal stability and thermal effects, may play a role in determining which particles can and cannot be trapped, as well as the fact that absorption and scattering depend strongly on the composition and geometry of the metal particles. These new findings indicate that it will be possible to stably trap and manipulate gold nanowires in three dimensions using multiple-spot holographic optical tweezers, enabling fabrication of functional nanoplasmonic systems. The ability to optically control and manipulate gold nanowires in three dimensions will benefit both fundamental investigations and applications. For example, when studying the acoustic vibrations of single nanostructures, it is desirable to keep the nanostructures away from substrates to avoid mechanical coupling. For gold nanowires, this could be partially achieved by suspending them over a trench fabricated in a substrate. In contrast, 3D optical trapping would provide a truly homogeneous environment for the nanowires. Optically trapped gold nanowires may also serve as probes for biological detection. For example, cytokine-carrying gold nanowires have been manipulated by electric fields to stimulate prespecified cells and reveal signaling events. Optical trapping represents an alternative approach, and these results provide the understanding required to take advantage in these applications of the large, plasmon-induced, near-field optical enhancement next to the nanowires.